To many, Pembroke is a town composed of rehabilitated old British buildings set among a very modern town. Its residents are Maltese, although it is also cosmopolitan due to the numerous schools and institutes based in Pembroke, and its proximity to the touristic and leisure hub, St Julian’s. But the history of Pembroke goes much further in time. In his Della descrittione di Malta, Gian Francesco Abela describes a “torretta nuoua di quelle che si sono fatte edificare dal Signor Gran Maestro Lascaris, ou’ è la guardia ‘Nadur ponente’”. This is one of the coastal watchtowers built between 1637 and 1649 in this part of the coast from St George’s Bay to Baħar iċ-Ċagħaq. Abela describes many of these locations, including the “Seno della Madalen, oue sono due guardie”, the “Punta di S. Giorgio”, and the “Guardia Oosc el Hamiema, cioè nido della Colomba”, which was possibly the name by which the area of Pembroke was then known. Between 1657 and 1660, Grand Master Fra Martin de Redin erected another 13 towers to guard Malta’s coast. One of these was the Madliena Tower, located on the high ground above the shore west of Ras l-Irqieqa, close to Baħar iċ-Ċagħaq. As an additional deterrent, a fougasse, a type of rock-hewn mortar, was excavated adjacent to Madliena Tower, between 1740 and 1770. Following the ousting of the Order of St John from Malta in 1798, the two eventful years of the blockade and the acquisition of the islands by Britain, Malta was ideal to serve British interests in the Mediterranean. Malta was the headquarters of the Royal Navy’s Mediterranean fleet, which secured a seaway vital to British interests. As this was still a time of the Napoleonic wars and other conflicts, and Malta was an ideal transit point for its troops, Britain maintained a garrison on the island to support its naval and other interests. During the first decades of the British presence in Malta, its troops were quartered in forts and casemated barracks in fortifications built by the Order of St John in The Three Cities, Valletta and Floriana. However, these were no longer suitable to sustain the needs of the large number of troops, some even having their families tagging along, since these billets had become crammed, unhygienic and too concentrated around the Grand Harbour. The Moroccan Crisis of 1844 and the Crimean War of 1854-1856 both served as a turning point in military administration and expenditure. During the Crimean War, Malta served as a staging post for bunkering, providing fresh supplies and repairing ships of the Royal Navy at the new dockyard. But mostly, the island served as a transit station and an outpost where wounded soldiers from that conflict could be treated. However, it was the British military establishment that was instrumental in the development and fortification of Pembroke. The first British connection in the area was the establishment of the Pembroke Cantonment Rifle Ranges, where various musketry shooting ranges were constructed, and where the soldiers marched to and lived in tents. In early 1859, the Secretary of War, Sidney Herbert, First Baron of Lea, had sanctioned the immediate construction of a stone encampment for musketry instruction, to be called Pembroke Camp. It is not clear whether the new camp was named after him or if he named it in honour of his father, Robert Henry Herbert, 12th Earl of Pembroke and ninth Earl of Montgomery (1791-1862). On January 6, 1860, the War Office authorised negotiations for the lease of land in St Julian’s overlooking St George’s Bay, intended to be capable of holding 1,000 men and to be provided with the latest improved sanitary facilities. 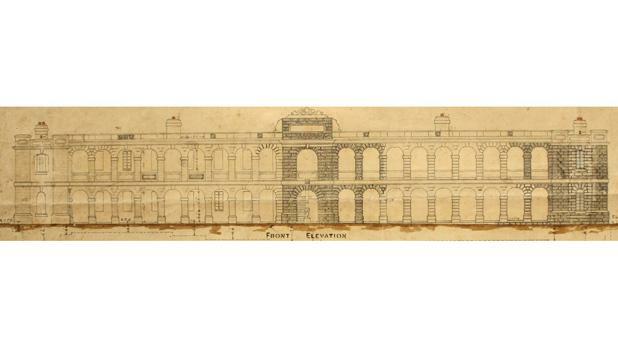 Detailed plans of the buildings were sent to London by the Governor and Commander of Troops in Malta, Lieutenant-General Sir John Gaspard Le Marchant, GCMG. From 1860, the Royal Engineers became responsible for the construction and maintenance of defences in Britain and later in the colonies of the British Empire. The Guard Room was inaugurated in 1860, and together with the barrack blocks and other facilities near the bay with a number of tented areas or camps further behind on the rocky ground. The Prince of Wales laid the foundation stone of the Soldiers Institute and Library at St George’s Barracks on June 6, 1862, during his visit to Malta. The permanent structures were named St George’s Barracks after the patron saint of England. The new barracks was very cost-efficient, considering that the total expenditure amounted to about one-fifth of the normal cost of constructing a barracks, or roughly £20 per person intended to occupy it. Much of the construction was carried out by using military labour, and members of the Royal Malta Fencible Regiment were found to be very proficient in working the particularly soft Maltese limestone. Two of the original barrack blocks still remain. The neoclassical style of architecture was ideal for the barracks, with their large porticos which gave ample shade in the hot summer months. One of the earliest regiments to be quartered at Pembroke was the 23rd (2nd Battalion Royal Welsh Fusiliers) Regiment of Foot, who were transferred from Isola Gate and San Francisco de Paola in Floriana during May 1862. The regiment was reviewed under arms by the Prince of Wales when he visited the barracks a month later. The Malta Gun Club based at Tigné became renowned by the Army for its Annual Malta Rifle Meeting at the Pembroke Camp, using the Martini-Henry rifle and carbine. The local garrison began to refer to the event as “the Maltese Wimbledon”. Catholic soldiers did not need a chapel at the camp, as they preferred to attend services at the little chapel of the Immaculate Conception in St Julian’s, while the Church of England regimental chaplain lived in the Vicarage adjacent to Moynihan House in St George’s Bay. Prior to the existence of Pembroke Camp, the only coastal defences in the area were Madliena and St George’s Towers. Madliena Tower was one of a few towers the British had retained and re-armed, modifying the parapet to take a 64-pounder Rifled Muzzle-Loading (RML) gun but which was later dismantled. In 1908, a Night Practice Battery was established on the grounds around the tower and armed with two 12-pounder Quick Firing (QF) guns with Defence Electric Lights. Fort Pembroke was built between 1875 and 1878 on one of the high ridges to defend approaches to the Grand Harbour. The fort’s main armaments were three 11-inch RML guns and one 64-pounder gun, and manned by personnel of the Western District, Royal Garrison Artillery. The guns at the fort needed to be updated but the military decided it would be cheaper to build a new battery. Pembroke Battery was started in 1897 and completed in 1899, armed with two 9.2-inch Breach-Loading (BL) Mark X guns. In 1919, the battery was struck off the armaments list and the guns were dismantled. It is unfortunate that the then barbette gun emplacements and part of the underground complex whichwere left were demolished during housing expansion in the 1980s. Named after Scotland’s patron saint, the first stone of St Andrew’s Barracks was laid by the Governor, Sir Francis Grenfell, on June 24, 1901. The plans were prepared between 1901 and 1903 and approved by Lt Colonel (later Colonel) R.M. Ruck, Commander, Royal Engineers West. They comprised barrack blocks in rows of two-storied dormitories, complete with ablutions and separate accommodation for the sergeants. Cook houses, messes, canteens, laundries, victualing stores, sports, stables and leisure facilities were erected for use by officers and other ranks, as well as houses for the officers and self-contained blocks for the married soldiers. 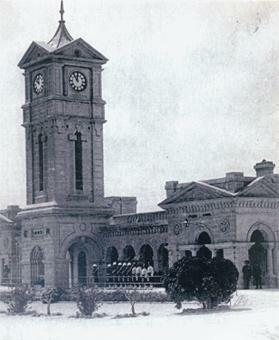 The guard room and imposing clock tower were built in 1903. St Andrew’s had its own regimental schoolmaster, and Moynihan House served as an adult school for British soldiers. A primary school for army children opened at St Andrew’s in 1908, which remained in use until 1978. By 1915, areas within the cantonment were vacated and converted into hospitals and convalescent camps for servicemen wounded in the Gallipoli and Salonika theatres of war between 1915 and 1917, and were named after saints. Some merely consisted of a number of weatherboard wards and offices, supported by long rows of tents. It was during this period that Malta received its Nurse of the Mediterranean nickname. One of the nurses to serve at Pembroke during this period was Vera Britain. 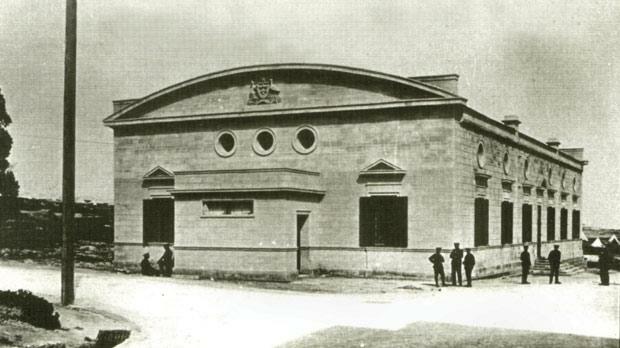 After the war, the Australian Red Cross paid for the construction of Australia Hall in gratitude for the care many Anzac wounded received in Malta, some remaining here forever. 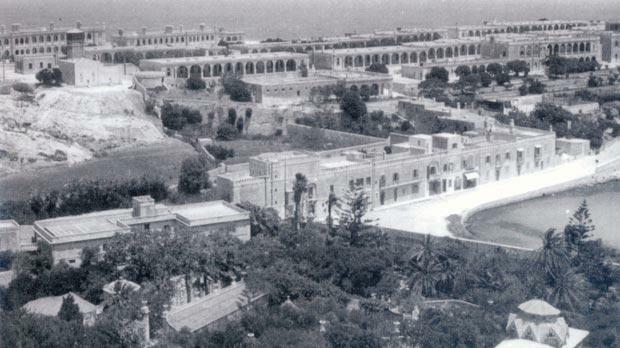 The barracks continued to grow with additions and facilities built after the war and well into the 1920s. St Paul’s Hutments were redeveloped as workshops for the Royal Engineers (REs). 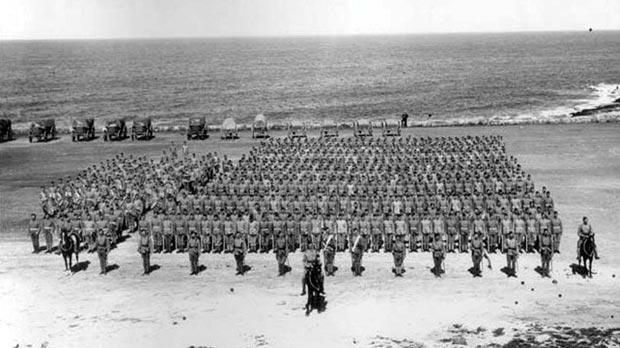 Pembroke boasted of being the earliest barracks to operate a Navy, Army and Air Force Institutes (NAAFI) establishment after it was created in 1921. More buildings were added to St Paul’s Hutments when the Royal Electrical and Mechanical Engineers branched out from the REs in 1942 and one of these new buildings was a series of very large adjoining garages and workshops that became known as The Silver City, due to its size and the silver-coloured corrugated metal roof. Due to situations during the 1930s, further expansion of facilities was approved for another large barracks at Pembroke that could be converted into a hospital during time of need, named St Patrick’s Barracks after the patron saint of Ireland. It was located near the small military cemetery in the area, which was adjacent to the main road leading to Baħar iċ-Ċagħaq. During World War II, part of the barracks was converted into the 45th General Hospital manned by the Royal Army Medical Corps, while another area was converted into a prisoner-of-war camp for captured German servicemen. It was named No. 1 Camp, and its Commander was Captain Micallef Trigona. During the war, the 2nd Battalion and the Static Group, King’s Own Malta Regiment, were stationed at St Andrew’s Barracks. Pembroke was not spared death and destruction during World War II, and deaths and destruction through enemy action are well recorded. After the war, small blocks of other ranks’ married quarters at St Patrick’s and a Sergeants’ Mess were completed around 1946 and an Officers’ Mess and recreational complex was built on the rocky foreshore in 1948. The last housing units to be constructed by the British at Pembroke were officers’ married quarters in the 1960s, now referred to as the White Rocks. The greater part of St George’s Bay and the Pembroke foreshore were exclusively used by the British as part of their establishment. The many rifle ranges remained in constant use, and the crack of rifle fire was common to this part of Malta. The last time that coast artillery was fired in Malta at the Pembroke ranges was the 3.7-inch guns by 37 Heavy Anti-Aircraft (HAA) Regiment Royal Artillery in 1959. 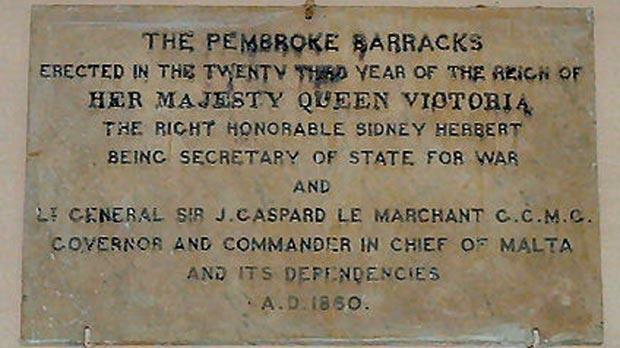 The number of British Army regiments and corps that served at Pembroke is too vast to list, although until the closure of this establishment in 1978, the main garrison force consisted of Royal Marines and ancillary detachments. Following the closure of the military facilities at Pembroke and the departure of the British Forces from Malta on April 1, 1979, the barracks were left in suspended animation. 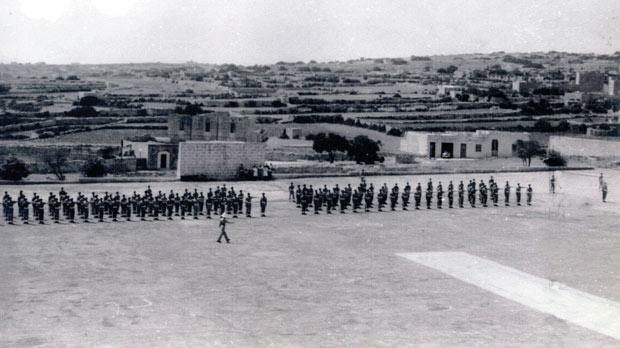 St Patrick’s Barracks had already been ceded to the Maltese Government in the early 1970s, when it became the then headquarters of the Malta Land Force. Pembroke still retains a relatively small military connection as the Armed Forces of Malta continue to make regular use of the E Rifle Range and its Plant Troop occupies a number of former Royal Electrical and Mechanical Engineers (REME) buildings at St Paul’s Hutments. In November 1989, the neighbouring town of Ta’ l-Ibraġ became an autonomous parish that included the Pembroke area. In the months that followed, the local government started leasing parts of the barracks as youth hostels, sports clubs and for entertainment purposes, while other barracks were renovated and rented as social housing. Following the Local Councils Act of 1993, which divided Malta into 68 localities, the mayor became the head and representative of the local council. The first Pembroke local council was elected in 1994 and its first mayor was Joseph Demicoli. The former disused chapel built by the German prisoners-of-war was demolished and replaced by a new pastoral centre. The parish of Pembroke is dedicated to the Risen Christ. Pembroke may be regarded as a town very modern in concept that is continually growing in importance. It can also boast of being very educationally orientated as numerous schools, colleges and other learning institutions have established themselves in the town. Pembroke Day is celebrated on July 4. Denis Darmanin wrote the book Pembroke, from a British Garrison to a Modern Civilian Town and donated it to residents through Pembroke local council, which published and sells it at a very low price.